Ok, I've stripped out the 'shaken' status from these rules. So that we're back to adding nerve markers for every 6 hits a unit receives. Note: After I finish running the paint judging at the Indy Open GT this weekend, I'm going to be running WarStrike walk-throughs and demo games for anyone who's interested in the project. Spag (the TO) is interested enough in what we're doing that he's already talking about having a WarStrike event for next year's Indy Open. Huzzah! To that end, I'll be updating as many of the current rules as I can, and summarizing everything else in the new Quick Reference Guide. That way folks can page through the current iBook and get a good feel for what we'll be releasing later. We should also get a LOT of good feedback from the GT crowd. It's always easy for a unit to follow orders when there aren't enemies around. But once the bullets start flying, it's a whole different ballgame. This is when the command skills of your unit leaders and officers will be tested. As they attempt to carry out your desires in spite of the grumbles of the troops they lead. Unlike other wargames, testing your units' leadership in WarStrike uses not one, but two different stats in combination. The first of these is Leadership (Ld), representing the command ability of your unit leaders and officers. The other is Nerve (Nv), which represents the morale and experience of your troops. Together, these two stats determine how many dice you must roll, and what at least one of those dice must roll in order to pass a Ld test. The primary method of reducing an enemy unit's will to fight during a game of WarStrike is to suppress it. Which, in practice, usually means hitting it with enough ranged fire to force it's models to keep their heads down instead of attacking your own units or capturing objectives. Suppression also comes into play in close-combat, where each side's morale will be ground down until one side of the other breaks and flees. A unit is considered to be suppressed any time that it takes hits from an enemy unit's shooting or melee attacks. Whether these hits actually end up killing a model in the unit doesn't matter. All that matters is whether or not the unit was hit, and how many total hits that unit has taken. Suppression affects a unit in 4 ways. First, a suppressed unit may not perform an action in the action phase. Instead, it will be forced to fall back. Second, a suppressed unit may not capture an objective during the starting phase. 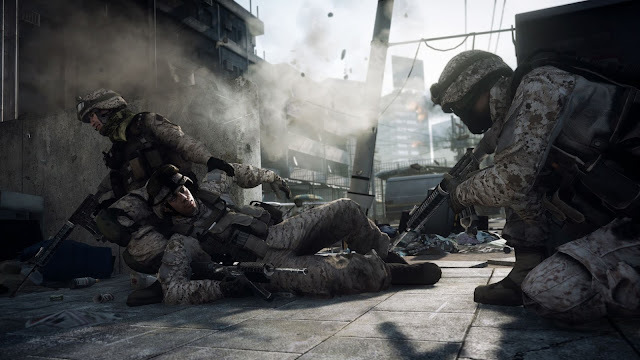 Third, a suppressed unit may not perform defensive fire when it is attacked by an enemy unit in close-combat. Fourth, a suppressed unit must perform a leadership test in order to continue fighting in close-combat, or they will fall back in retreat. To indicate that a unit is suppressed, you will use a Hit-Die. A hit-die is simply a six-sided die that is placed next to the unit. With which you will record the number of ranged and/or close-combat hits that it has recently taken. If a unit has a hit-die, then it is considered to be suppressed. If a unit does not have a hit-die, then it is not suppressed. If the rules say that something clears or removes a unit's suppression, then that means the Hit-Die will removed from the unit. Whenever an unsuppressed unit is hit by ranged fire, or melee attacks, add a hit-die to that unit. Then turn the die to indicate how many hits that unit has taken. If the unit was already suppressed, then add the number of hits it has received to the number of hits that are already indicated on the die. If the total number of hits to be recorded on the hit die is greater than 6, then the count on the hit-die will 'start over' at one and continue until all hits have been added. Each time the count on the hit-die reaches 6, the unit will receive one nerve marker. As an example, let's say that an unsuppressed unit takes 15 hits from ranged fire. The first twelve hits would result in the unit receiving 2 nerve markers, with 3 hits left over. So the player would add 2 nerve markers to the unit, and then turn the hit-die to 3. Had the unit received 12 hits, it still would receive 2 markers, but the hit-die would be left at 6. There are two ways for a unit to clear it's suppression during a game. The first is during the reaction phase of your opponent's turn. When each of your suppressed units will roll a leadership test. If this test is passed, then that unit's hit-die will be removed, and it will no longer be suppressed. The other way for a unit to clear it's suppression is for it to force an enemy unit to fall back or rout from close-combat. Performing a leadership test is quite simple. A Leadership Test is performed by rolling a number of dice equal to the testing unit's current Ld value. The test is passed if any of the dice roll equal to, or less than, the unit's current Nv value. So for example... let's say that you have a Ld 2, Nv 3 unit of LaansGuard that needs to roll a Ld test. To perform the test, you would roll 2 dice; hoping that at least one of them comes up as a 3 or less. 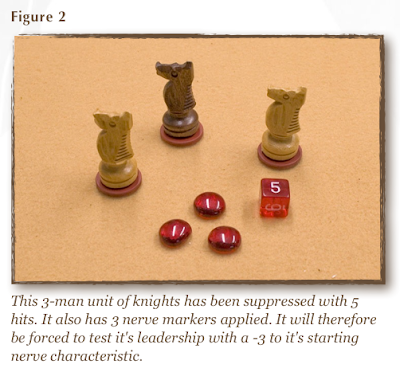 Whereas a Ld 1, Nv 5 Knight Paladin would roll one die, and the leadership test would succeed if a 5 or less was rolled. When a unit's confidence takes a beating from the actions of the enemy, this is represented by the use of nerve markers. Each of which makes it more difficult for that unit to pass a Ld test. For every 6 hits that a unit receives from ranged and/or close-combat attacks, it will receive one nerve marker. For every nerve marker a unit has, that unit's starting Nv will be reduced by one point. A unit may never have more nerve markers than it has points of starting Nv. A unit can also gain nerve markers if any of it's models is killed, or at least wounded, by an enemy's attacks. If a unit fails at least one saving throw against a salvo of attacks, then that unit will receive a single nerve marker. This is in addition to any nerve markers the unit may have already received as a result of taking 6 or more hits. If a unit hasn't been attacked, or keeps it's cool by clearing it's suppression during the reaction phase, then it will be able to remove a marker. It can also remove a marker by performing certain types of actions, or by causing an enemy unit to flee in combat. An unsuppressed unit, during the starting phase of its player's turn, may remove 1 nerve marker. A unit performing a Get Down! action, or which falls back during the action phase, may also remove one nerve marker. For each enemy unit that fails a leadership test in close-combat, all opposing units within 6" of that unit may remove one nerve marker prior to it's fall-back or rout move. If an Officer or Hero has the Inspiring special rule, then they may be able to bolster the morale of all nearby troops by giving a rousing speech or battle cry! When rolling a leadership test, any unit within 6" of an inspiring officer/hero may use the current Nv of the Officer or Hero instead of its own current Nv. Some units are harder to shake up than others. A unit with the steadfast special rule requires 12 hits to gain a nerve marker, instead of the normal 6. 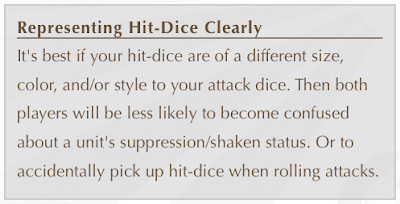 Use a second hit-die, as required, to track hits 7-12. If the unit's suppression is cleared, then all of its hit-dice will be removed together. All of the ranged shooting attacks which are targeted against one unit by another. Or all of the close-combat melee attacks which are directed by one unit against another. A unit may perform multiple salvos, by attacking multiple enemy units at once. But a unit may only ever receive a single salvo from any one enemy unit.